MADISON—Lunch just ended and La Follette High School junior Eric Hotchkiss is leaving campus for the day. He’s not headed home or to hang out with friends; this 16-year-old is going to college. 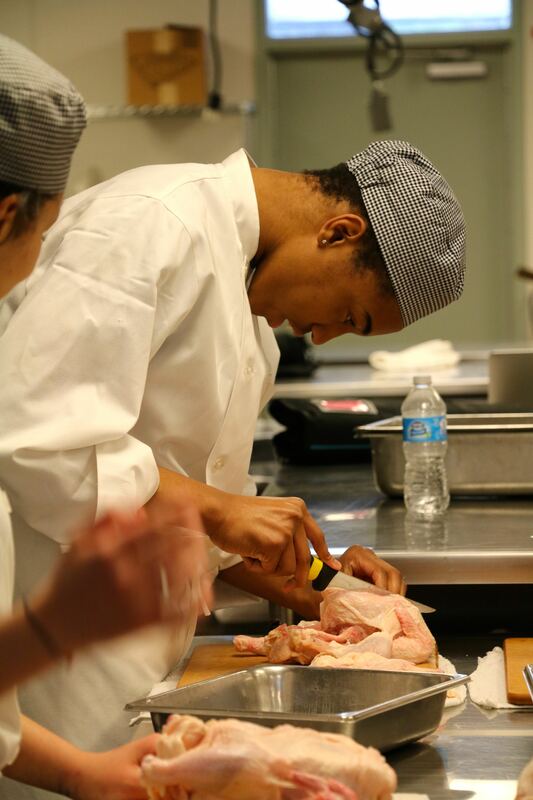 Hotchkiss is a culinary arts student at Middle College, a dual-credit career pathway program for high school juniors with hopes of advancing their education in one of three industries: healthcare, manufacturing or culinary arts. Madison Metropolitan School District partners with the Workforce Development Board to deliver Middle College, a program to re-engage students in school through dual credit and internship opportunities. After his morning high school courses, Hotchkiss rides a taxi to his afternoon classes at the Madison College Truax campus, one of a handful of technical college campuses that host the Middle College program. On Thursdays, he trades his books and assignments for his chef’s beanie and apron and meets his classmates at the northside’s FEED Kitchens for his 12:30-5:00 p.m. cooking lab. Here he’s earning credits toward an associate’s degree, and if all goes as planned, he’ll graduate high school in 2016 with five courses completed toward an Associate in Applied Science 2-year degree and a full scholarship to finish it at Madison College. “Why do I need to learn this?” That’s one question high school teachers hear over and over from students disengaged with the traditional school setting. Middle College offers a refreshing change of pace, with a hands-on approach to learning and a tangible goal to work toward — a career. Tiajuana Rice, Workforce Development Board Director of Programs, stresses that not every student who has an aversion to homework or daydreams during class is a good candidate for the program. To succeed here, it takes “a willingness to learn” and to “take advantage of opportunity,” she notes. Copyright 2019, WDBSCW. The Workforce Development Board of South Central Wisconsin is an equal opportunity employer/program service provider. If you need assistance to access our services in a different language or need this material in an alternative format, contact us. Deaf, hard of hearing, or speech impaired callers may reach us by using Wisconsin Relay Services at 711. Proud partner of the American Job Center network.